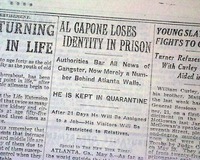 Page 6 has a one column heading: "AL CAPONE LOSES IDENTITY IN PRISON" with subheads. 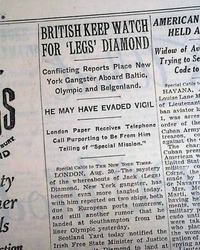 (see) Always nice to have notable events in history reported in this World famous publication. 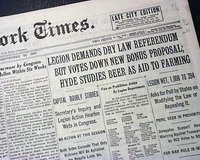 The front page has a three column headline: "LEGION DEMANDS DRY LAW REFERENDUM BUT VOTES DOWN NEW BONUS PROPOSAL; HYDE STUDIES BEER AS AID TO FARMING" with many subheads. 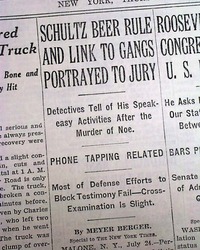 Lengthy text continues inside. 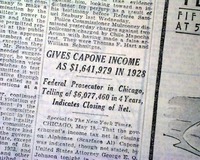 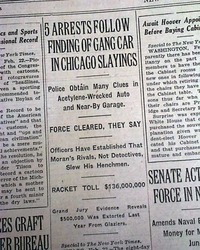 Page 5 has a one column heading: "Gives Capone Income As $1,641,979 In 1928" with subhead. 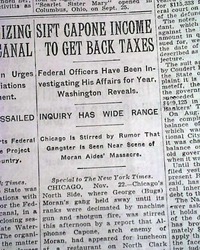 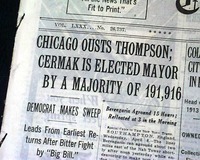 (see) Was this the beginning of the end for Capone ? 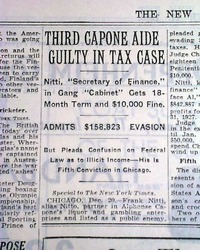 He would eventually be tried and convicted if income tax evasion later that year. 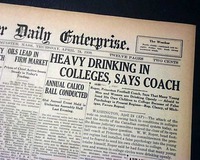 The top of the front page has a three column headline: "HEAVY DRINKING IN COLLEGES, DAYS COACH" with subhead. 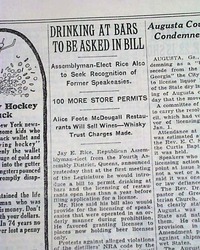 (see) A look back in college life during the prohibition era. 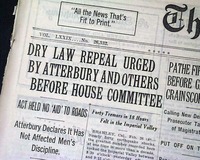 * Dry law to continue in the U.S. 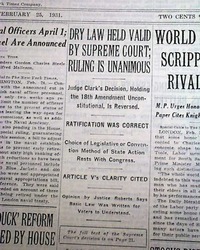 The front page has a one column heading: "DRY LAW HELD VALID BY SUPREME COURT; RULING IS UNANIMOUS" with subheads. 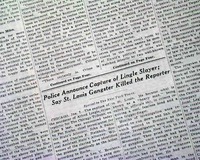 (see) First report coverage on the United States v. Sprague Supreme Court decision with complete text on page 21. 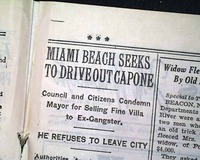 * Al 'Scarface' Capone murder plot ? 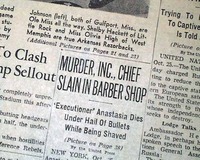 This 38 page newspaper has one column headlines on the front page: "MURDER, INC., CHIEF SLAIN IN BARBER SHOP"
"'Executioner' Anastasia Dies Under Hail of Bullets While Being Shaved"
The front page has a one column heading: "REPEAL LOST IN CONGRESS BY 144 TO 171" with subheads. 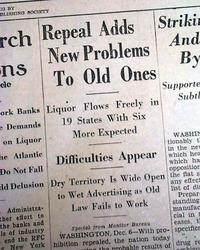 (see) Ironically the repeal of prohibition would be ratified exactly one year later on December 5, 1933. 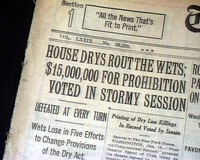 * Wets vs. Drys in Washington D.C.
* Beginning of the end ? 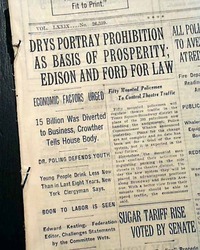 The front page has a two column headline: "DRYS PORTRAY PROHIBITION AS BASIS OF PROSPERITY; EDISON AND FORD FOR LAW" with subheads. 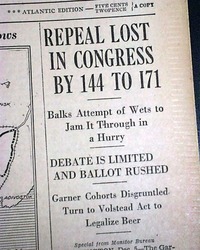 (see) Was this the beginning of the fight to repeal prohibition ? 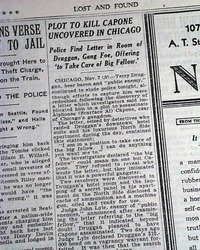 Lengthy text continues inside. 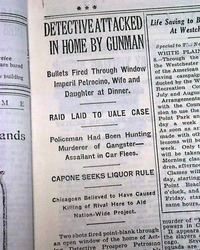 The front page has a small one column heading: "Zwillman a Suicide In Jersey Mansion". 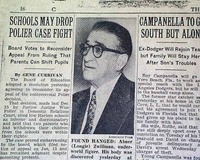 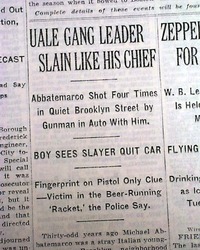 This is 1st report coverage on the death of prohibition gangster, Abner Zwillman. 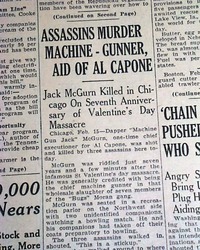 Coverage continues inside with photo of Zwillman. 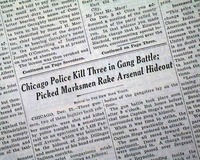 Other news of the day. 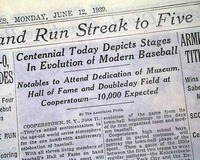 Complete 1st section only with all 18, rag edition, a little irregular along the spine, otherwise very nice. 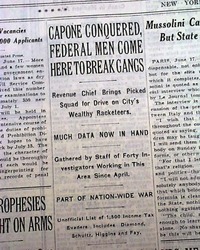 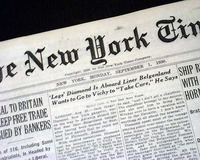 THE NEW YORK TIMES, July 25, 1933. 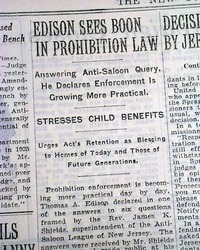 Page 5 has one column headings that include: "DRINKING AT BARS TO BE ASKED IN BILL" "100 More Store Permits" and more. 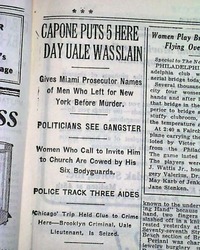 (see) Always nice to have notable events in history reported in this World famous publication. 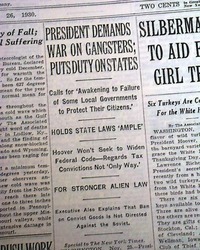 NEW YORK TIMES, November 26, 1930. 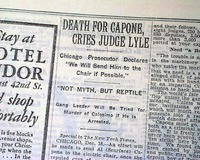 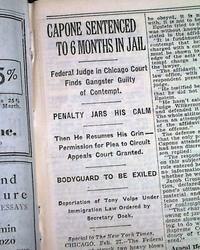 Page 3 has a one column heading: "CAPONE SENTENCED TO 6 MONTHS IN JAIL" with subheads. 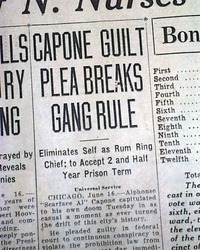 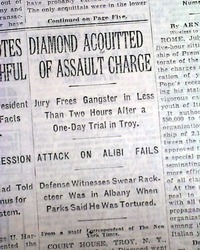 (see) First report coverage on Al 'Scarface' Capone being found guilty of contempt of court. 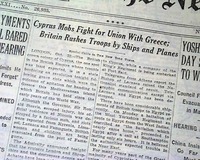 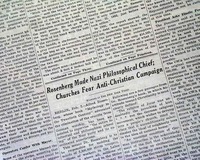 THE NEW YORK TIMES, June 12, 1939. 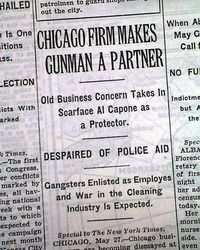 The front page has one column headings that include: "CHICAGO FIRM MAKES GUNMAN A PARTNER" "Old Business Concern Takes In Scarface Al Capone as a Protector" and more. 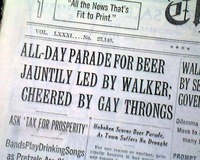 The front page has a two column headline: "ALL-DAY PARADE FOR BEER JAUNTILY LED BY WALKER; CHEERED BY GAY THRONGS" with subheads that include: "Bands Play Drinking Songs as Pretzels Are Strewn in Marchers' Path" and more. 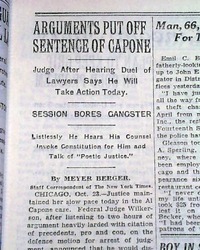 (see) More on page 3 with related photos. 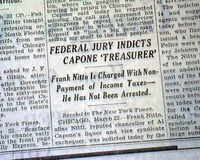 THE NEW YORK TIMES, October 19, 1929. 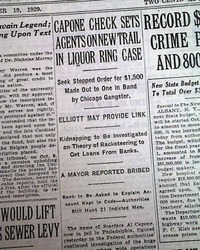 The front page has one column headings: "CAPONE CHECK SETS AGENTS ON NEW TRAIL IN LIQUOR RING CASE" "Seek Stopped Order for $1,500 Made Out to One in Band by Chicago Gangster" and more. 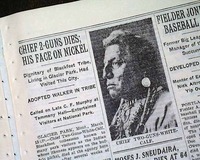 Page 19 has one column headings: "CHIEF 2-GUNS DIES; HIS FACE ON NICKEL", "Dignitary of Blackfeet Tribe, Living In Glacier Park, Had Visited This City" and more with photo of the chief (see photos). 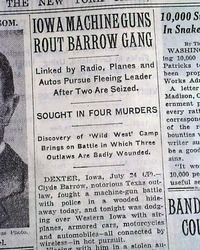 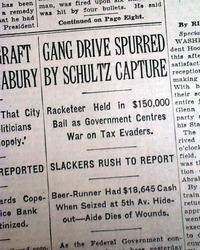 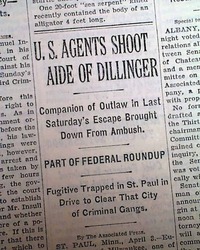 The front page has one column headings that include: "U. S. AGENTS SHOOT AIDE OF DILLINGER" "Companion of Outlaw in Last Saturday's Escape Brought Down from Ambush" "Part Of Federal Roundup" and more. 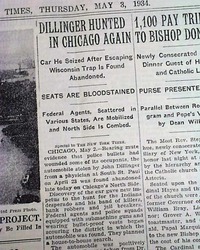 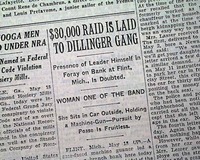 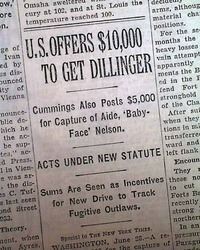 The front page has one column headlines: "U.S. OFFERS $10,000 TO GET DILLINGER"